Sherpa Jacket: I cannot say enough nice things about this pattern. However, my version of it looks sort of like a geoduck at the moment - the body is folded and trussed so it's not flopping around on my lap and getting all twisty as I knit the sleeves, which are picked up and knitted in the round. I love doing sleeves this way because (1) I can avoid purling, and (2) I can try the sweater on so can see how the shoulder shaping is looking early on. In this case, it's really, really good. I picked up the stitches and knitted half a sleeve yesterday. It's crazy talk, but I think I might just finish this guy this week. Stripey Socks: One down, one to go. The second sock may take a bit longer than planned, since I stole its needles for some Secret Knitting. I feel really guilty about this, since failing to cast on the second sock of a pair immediately after you finish the first one is a huge invitation for Second Sock Syndrome. It just can't be avoided. Anyway, the Secret Knitting is just a swatch. Not even a really big swatch. A teeny tiny swatch. What could possibly go wrong? Ahem. Krewe: This is a new pattern from Leethal for a summer-weight cowl inspired by Mardi Gras beads. After some fancy work with dropped stitches, this is going to be lacy and light. 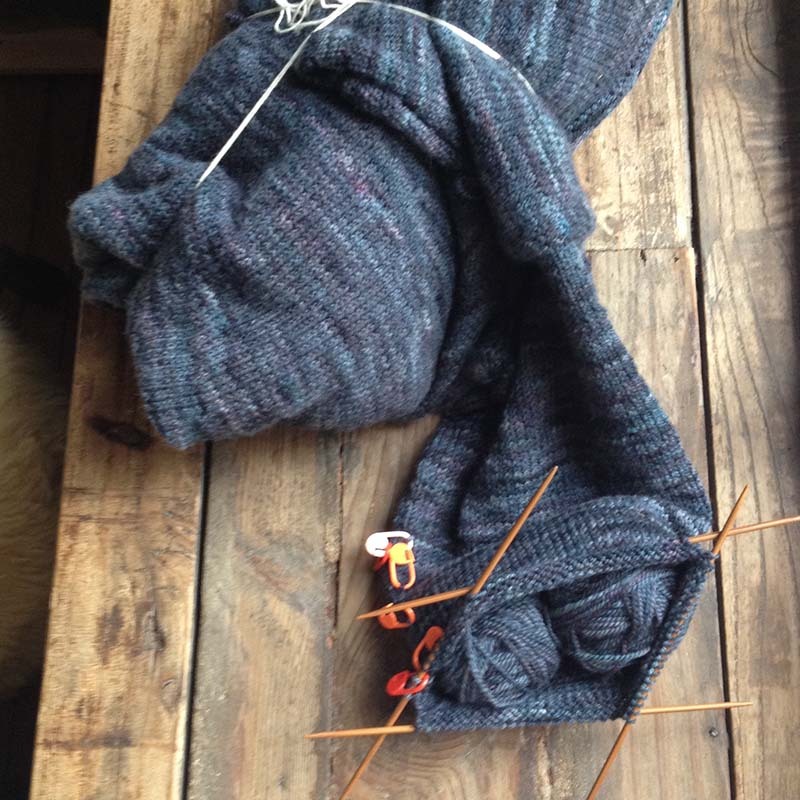 It's already looking lovely, and the design is a thoroughly engaging knit. Highly recommended. As with all of Lee's patterns, her clear instructions and photo tutorials make it easy work out of some very fancy techniques. The pattern features a chart and row by row instructions as well. I even have kits for it, which will be in the shop this week. In the meantime, you can email me to reserve one if you like.